QAA 2000-2005 Cadillac Deville 4pcWheel Well / Fender Trim by QAA at Beaver County Collision. MPN: WZ40245. Hurry! Limited time offer. Offer valid only while supplies last. Product Description: Make your 2000-2005 Cadillac Deville more elegant and stand out from the rest with our 4 piece stainless steel wheel well trim. 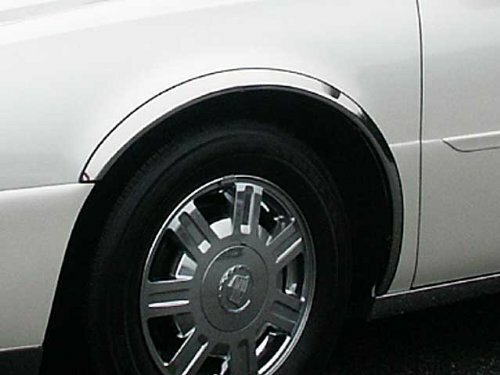 Product Description: Make your 2000-2005 Cadillac Deville more elegant and stand out from the rest with our 4 piece stainless steel wheel well trim. Our wheel well trim are made using high quality stainless steel and have been molded to the shape of the wheel opening. The rubber gasket on the outer edge is to prevent the trim from scratching the paint and offer a factory finished look. The trim can be screwed on for a more permanent installation or fastened on with our locking hook tabs. Installing our wheel well trim is easy. You can mount our wheel well trim with locking hook tabs or for a permanent fit you can screw them on. Both screws and hook tabs are included with every wheel well kit. More About Wheel Well Trim w/ Locking Tabs: Our wheel well trim are molded to the shape of the fender. It typically is wider in the middle and tapers on the ends. A black rubber gasket is placed on the outer edge to prevent scratches. With this trim, you have the option to screw on or clip on with locking tabs or both. Screws and locking tabs are included with each trim kit. Clip on or screw in installation, Lock Tab and screws, hardware included. If you have any questions about this product by QAA, contact us by completing and submitting the form below. If you are looking for a specif part number, please include it with your message.